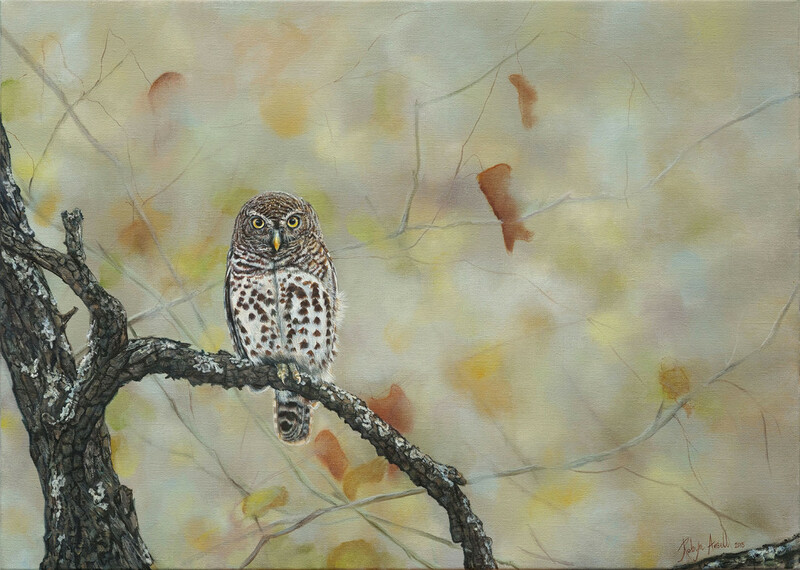 I have always loved owls and I have been dying to paint one for as long as I can remember. This piece is extra special to me as my fiance’ took the photo on the day he proposed to me in Kruger National park last Oct. We spent quite a bit of time watching this little guy hunting in a Mopane scrub thicket in the early hours of the afternoon, inside the grounds of Tsendze rustic camp- what a privilege! This piece was an absolute joy to create, the owl itself is a “life-size” replication at just 21 cm. I had such fun building up the colours and textures of the Mopane branch. I wanted to keep the background more simplistic, adding just a few faint indications of the last withered Mopane leaves hanging on after a long dry winder. This piece will always serve as a reminder of the most fabulous KNP trip.